Last month, Suntup Editions introduced their first of two spectacular cover art prints signed by artist Michael Whelan, The Dark Tower: The Gunslinger. 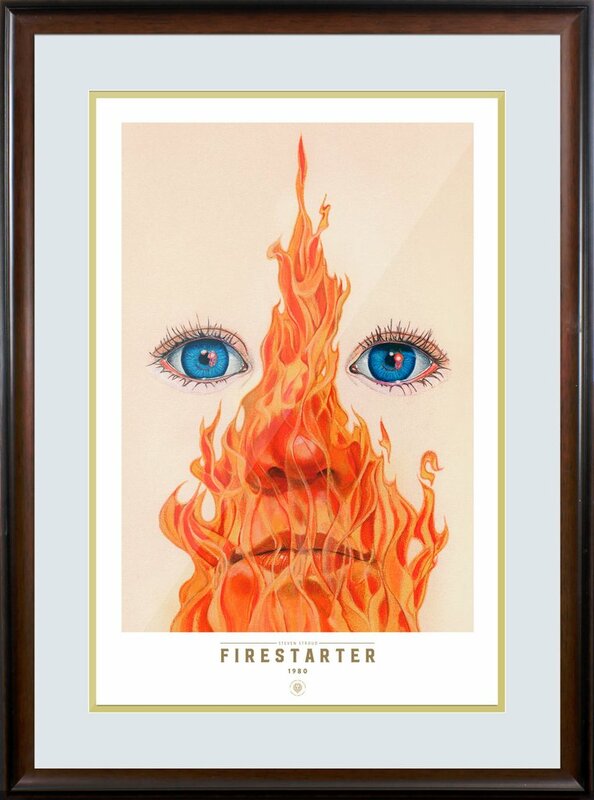 They are now delighted to reveal the Firestarter Limited Edition Cover as the second of their Whelan additions to The Covers Collection. 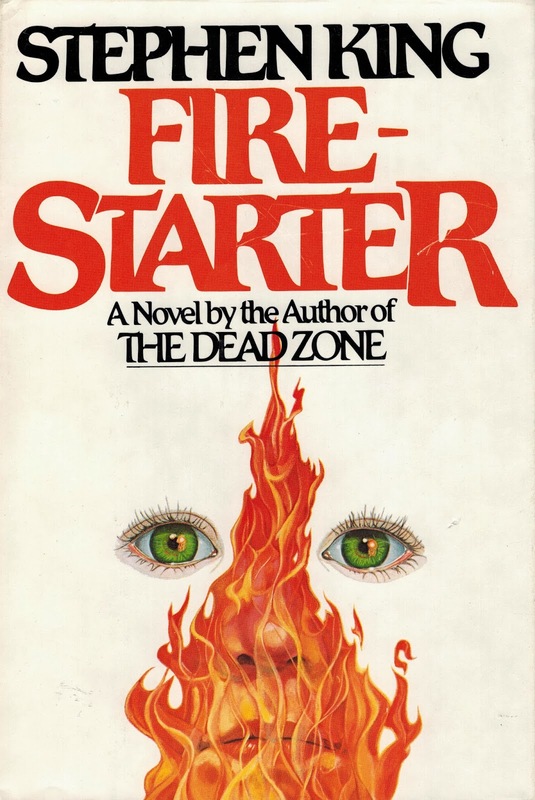 Published by Phantasia Press in 1980, the same year as the novel’s wide release, the limited edition of Firestarter features Charlie exhibiting her pyrokinesis power at full blast. This gorgeous painting predates the movie version by 4 years. Whelan used his niece Laina as his model, but many fans have commented on the girl’s similarity to Drew Barrymore. The cover art for this edition so impressed Stephen King at the time that he personally recommended Whelan as the artist for the Donald M. Grant edition of The Gunslinger. 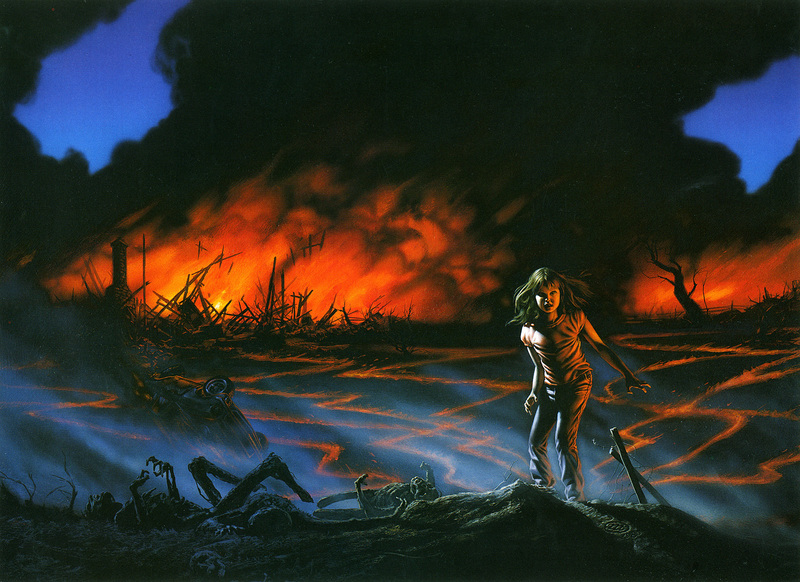 These prints are hand-signed by Michael Whelan, exclusively available through Suntup Editions for your private collection. Limited to just 50 copies per size, worldwide. – Museum Quality Giclée prints. – Signed and authorized by the original cover artist. – Limited to only 50 copies of each size worldwide, plus 3 Artist Proofs and – 3 Publisher Proofs for private distribution. – Shipped with a Certificate of Limitation and Authenticity from the publisher. – Printed on 300 GSM, 100% cotton paper that is Acid-Free, Lignin-Free, Chlorine-Free and with No Optical Brighteners. 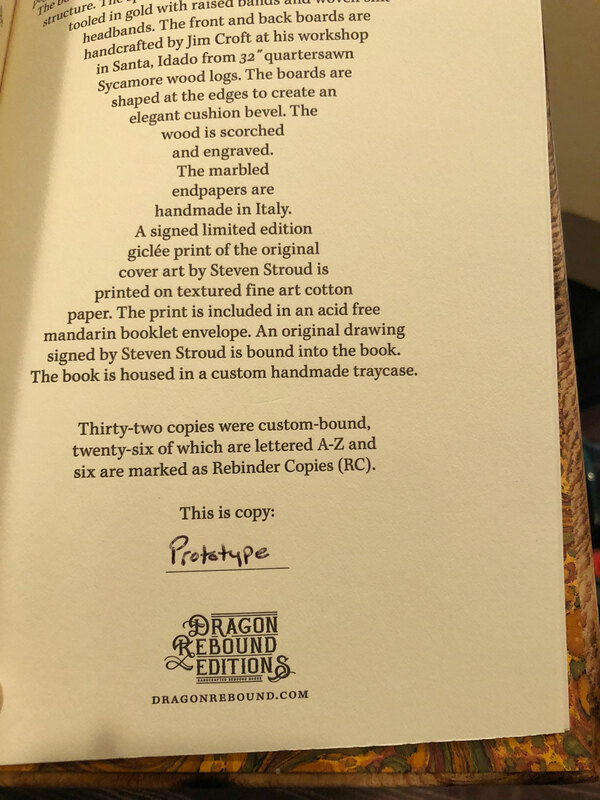 – Prints are embossed with the publisher’s mark. 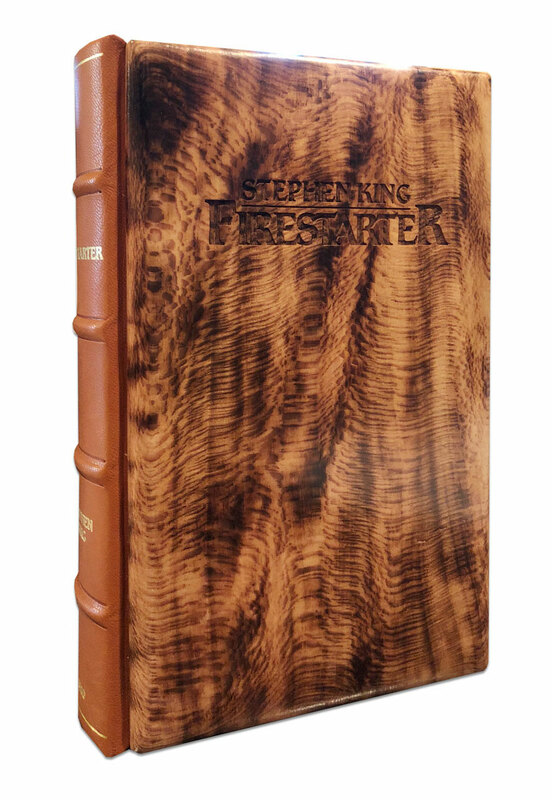 Dragon Rebound Editions is offering a rare custom bound Stephen King Firestarter for auction. 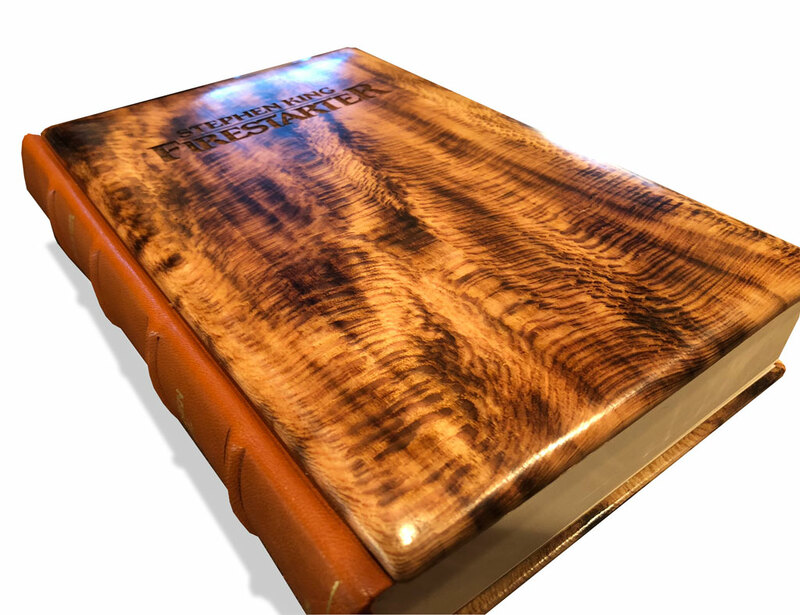 This is one of only two prototype copies that were made for the purpose of experimenting with different wood finishes. This copy has a gloss finish as opposed to matte which was used for the final run. 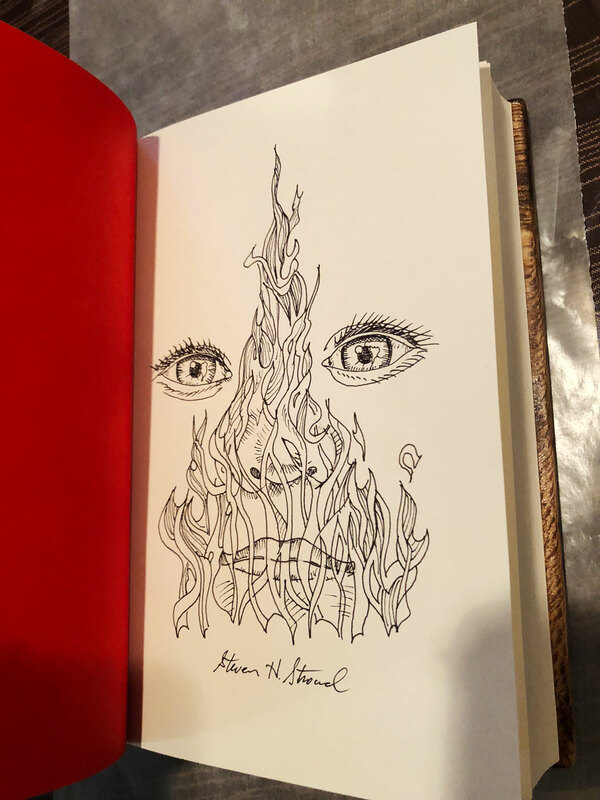 Included is a black and white ‘flame and eyes’ original drawing by Steven Stroud which is bound into the book, and it is designated “Prototype” on the colophon page. 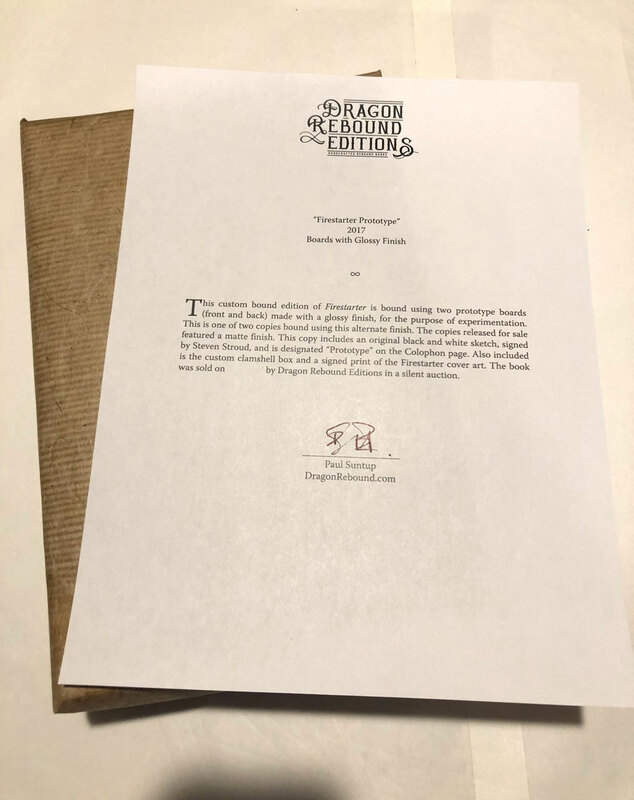 It will include a signed print of the Firestarter cover art, the custom clamshell box, and a letter of provenance. To participate in this silent auction, send an email using the contact form HERE with your highest bid. The winning bid will be adjusted so that it is $100 more than the next highest bid. For example, if the 2nd highest is $2,500, and the highest is $3,000, the winning bid will be adjusted to $2,600. The minimum opening bid is $1,000. The auction will end at 12:00PM Pacific Time on Friday, January 12, 2018. Shipping is free in the United States. A portion of the proceeds from this auction will be donated to a charity for the elderly and disabled. Suntup Editions is pleased to present Firestarter by Steven Stroud. 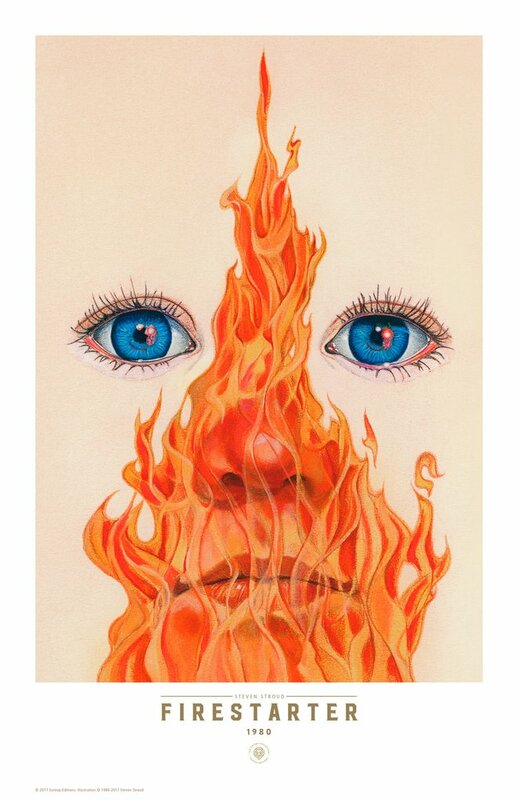 In this version of the cover art from Firestarter, the eyes are colored blue. If you look at the dust jacked on the book copy, the eyes are green. The reason for this is that when Steven Stroud was creating this painting, there was no information provided as to the color of Charlie’s eyes. Stephen King thought that green would go well with the flames. It was later discovered that the eye color was described as blue in the text. So they were changed for the paperback edition. The only version of the original painting that exists has blue eyes, because the version with the green eyes was painted over. 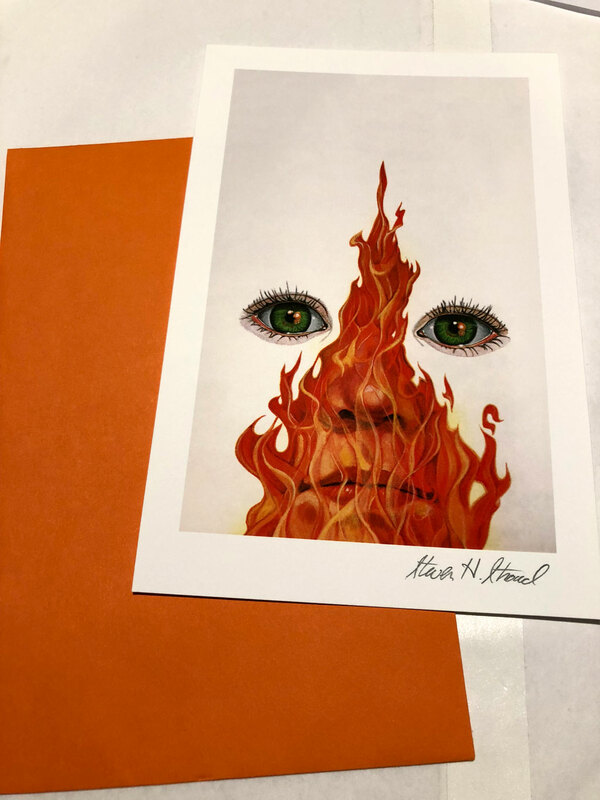 These prints are hand-signed by Steven Stroud, and the first 20 include an original Remarque, which are already pre-sold to print subscribers. Exclusively available through Suntup Editions for your private collection, and limited to just 50 signed copies per size, worldwide. A Stephen King-inspired series is headed to TNT. 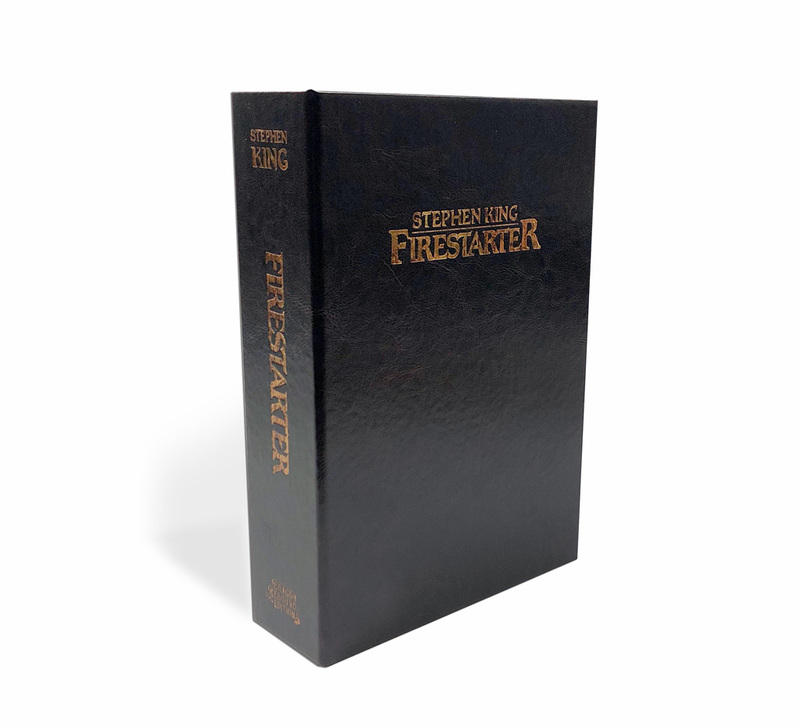 The cable network is developing The Shop, a sequel to King’s 1980 bestseller Firestarter. The drama centers on the insidious agency responsible for kidnapping and attempting to exploit the psychokinetic powers of a young girl named Charlie McGee in the original story. The project is written by Robbie Thompson (Supernatural) and produced by James Middleton (Terminator: The Sarah Connor Chronicles), Jaime Paglia (Eureka) and Thompson.